Cercarial dermatitis is caused by animal schistosomes in many parts of the world including Iran. 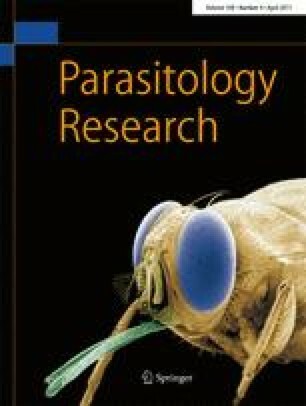 Various stages of the parasites have been studied in intermediate and definitive hosts in northern and southwestern Iran; however, no molecular investigation for species identification and classification of these agents has been carried out, so far. In the present study, more than 3,800 aquatic snails were collected from water sources of Khuzestan, southwest Iran. The snails were identified as Lymnaea gedrosiana, Radix auricularia, Melanoides tuberculata, Melanopsis sp. and Physa acuta. They were examined for schistosome cercariae. Two specimens of M. tuberculata were infected with ocellate furcocercariae belonging to the family Schistosomatidae. Molecular studies were carried on these schistosomatid samples. Both samples belong to an unknown schistosome species and genus in sister position to Gigantobilharzia–Dendritobilharzia clade. They differ from other species in their ITS sequence region as well as in their intermediate host specificity—This is one of the first reports on schistosome cercariae from M. tuberculata and the first including molecular data. Due to adaptability and invasiveness of this snail species, this new schistosome species, as a potential causative agent of cercarial dermatitis in humans, needs to be studied further. The authors would like to thank Dr. Mowlavi from the Department of Parasitology and Mycology, Tehran University of Medical Sciences, Tehran, Iran, for his kind help; Dr. B. Vazirian-Zadeh and Dr. M. Rahdar from Ahwaz University of Medical Sciences Mrs S. Kazemian and all the people from the Health Center of Khuzestan province. This study has been supported by the Shiraz University of Medical Sciences Grant No. 4312.